Will Apple, Inc. Stock Hit a New All-Time High on Hot, New Products? 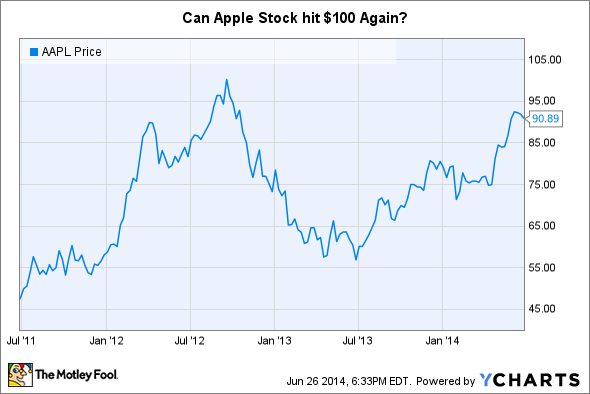 Can Apple stock finally pass its all-time high of just more than $100? Try $108. Will Apple (NASDAQ:AAPL) stock ever reach levels above its post-split all-time high just more than $100? After reaching those levels in 2012, it's only recently that the stock has made its ascent toward $100 again. But Apple investors may soon taste levels well above $100, according to one analyst. Enter J.P. Morgan analyst Rod Hall (via AppleInsider). Despite a fairly conservative average price target from analysts for Apple stock of about $95, Hall is betting there is much more upside to the stock than the consensus target suggests. Hall upgraded his price target for Apple shares this week from $89 to $108. Hall's reasoning? Multiple new products toward the end of the year, as well as a completely redesigned iPhone, are about to help Apple grow earnings faster than the Street expects, he predicts. While Hall acknowledges that Apple probably will launch the so-called iWatch, he doesn't see it as a product category that will move the needle on Apple's massive bottom line. Meaningfully budging Apple's bottom line, indeed, wouldn't be an easy feat for an entirely new product category. In the 12 trailing months alone, Apple brought in a whopping $37.7 billion in earnings. But the redesigned iPhone 6? The next-generation Apple-branded smartphone lineup could be a meaningful driver for growth, he predicts. After all, the segment accounts for a monstrous 57% of the company's revenue, and an even larger portion of operating profits; if the phone is a success, it could provide a huge boost to earnings. iPhone 5s. Apple's iPhone business is the company's largest business segment -- by far. Coming in second is Apple's iPad business, with less than a third of the revenue attributed to iPhone sales. Image source: Apple. The shifting sentiment for Apple stock isn't surprising. No matter how you slice it, Apple stock looks cheap. Trading at a price-to-earnings ratio of 15.2, it even trades at a meaningful discount to the broader S&P 500, which has a price P/E of 19.3. And Apple isn't just any large cap stock; it's an industry leading cash cow with a loaded pipeline of new products ready for launch this year. While I'm not in the business of playing the price-target game, I do believe the stock is significantly undervalued. I recently pegged a fair value estimate on the stock of $120. With loads of cash already authorized to use for share repurchases, a meaningful dividend, and a pipeline of new products, Apple likely won't be wallowing in the all-too-familiar sub-$100 levels much longer.